Are you a highly motivated and talented sales professional with at least two years experience in advertising sales or sales in general? Are you positively bursting with drive, energy, enthusiasm and a “whatever-it takes” attitude? If so, JWC Media wants to speak with you. 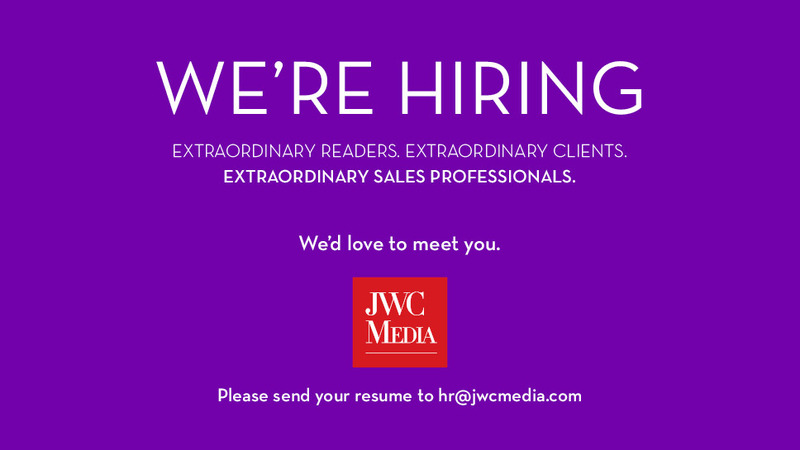 JWC Media is looking for highly motivated, ambitious, outgoing and enthusiastic advertising Account Managers to develop business and close deals for our amazing suite of products…including Sheridan Road Magazine, Forest & Bluff, Country Magazine – Barrington, Hinsdale Living, and more! By joining us you will be rewarded with a competitive salary & commission package and a fantastic career opportunity only a growing company like JWC Media can provide. JWC Media publishes 4 magazines, a weekly newspaper and several web sites. Our headquarters are on the North Shore, but this position would selling out in the field. Ideally, our candidates would live on the North Shore or the Northwest suburbs. JWC Media has a fast-paced, high-performance culture and the company’s products are market-leaders, driven by a team of high-achieving, talented professionals. This is a fantastic opportunity to fast track your career by joining an ambitious company that is growing and thriving. Interested candidates, please email a cover letter outlining why you want to join JWC Media along with your detailed resume stating your present & expected salary to [email protected].